I already found an original Xbox cast off in a recycle pile about 4 years ago. However, that one sits in a state of disassembly for some optical drive hacking experiments I was conducting awhile back. 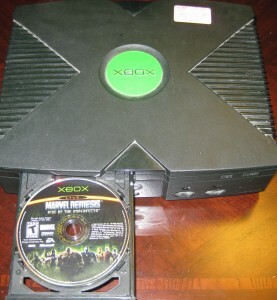 So when I found another unit at my favorite thrift shop for only $6, I snatched it up immediately in case I feel inspired to actually play an Xbox disc. A copy of Marvel Nemesis: Rise of the Imperfects. What are the stickers for? It seems clear that this is some manner of counterfeit. 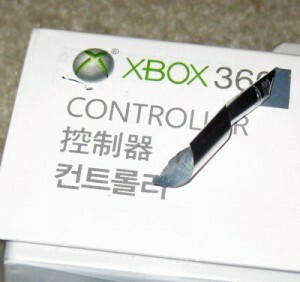 Were the sellers legally required to cover up Xbox 360 markings? Perhaps they were barred from selling these and decided to just drop them off at this thrift shop. So it’s a good bet that it’s a counterfeit controller. But what’s the difference between this and the real deal? 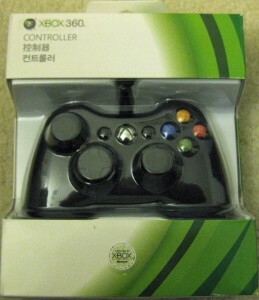 I don’t have an Xbox 360 so I don’t have much experience with how this differs from an authentic controller. It looks legit to me and would have fooled me were it not for the weird box stickers. I recently procured a Steam Link device and this controller appears to work perfectly. 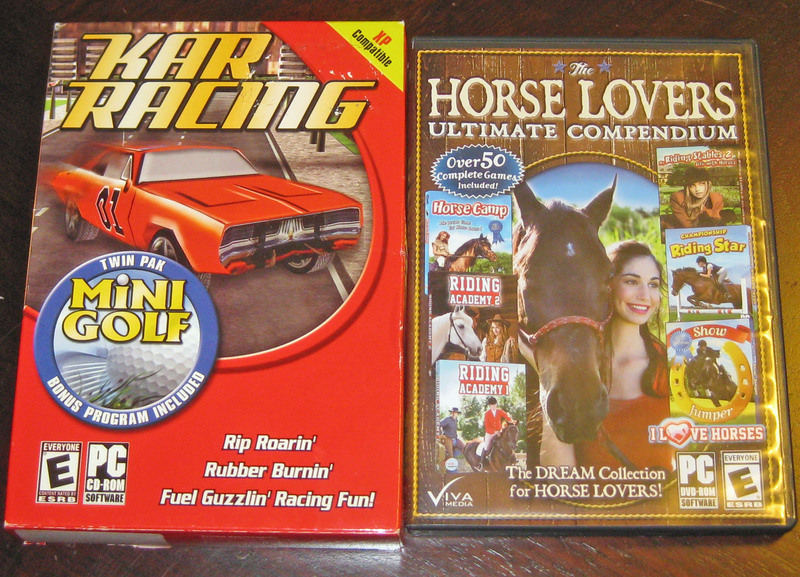 However, I dug up this Gaming.StackExchange thread in which someone procured the same counterfeit item. 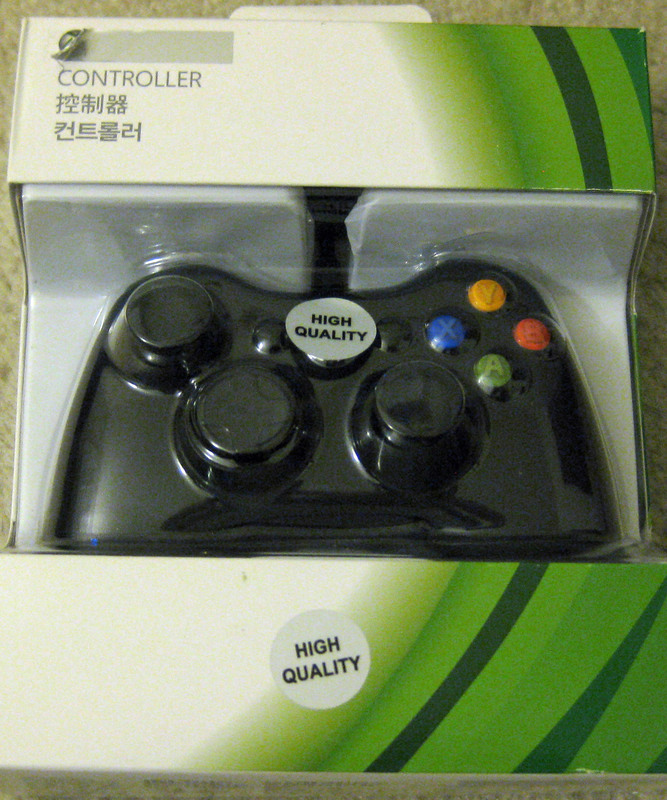 They determined that the analog controller actually acts as a digital gamepad. I.e, it only has 9 discrete positions rather than offering a continuous range of coordinates. Elroy’s Costume Contest, from Headbone Interactive (1996): This is interesting. 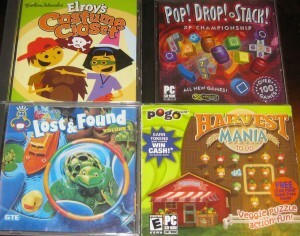 I have previously acquired 2 other Elroy games and covered them in a previous entry. In checking to see if anyone else had heard of these games and if there were any other games in the series, I found that someone had cared enough about this series to set up a dedicated Wikia space for it which only mentioned the 2 games. I assumed that was the last word on the matter. Evidently not. Pop! Drop! + Stack! XP Championship, from SelectSoft games (2006): What a curiously punctuated title. 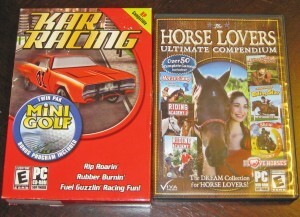 The box claims to have “Over 100 Games”. 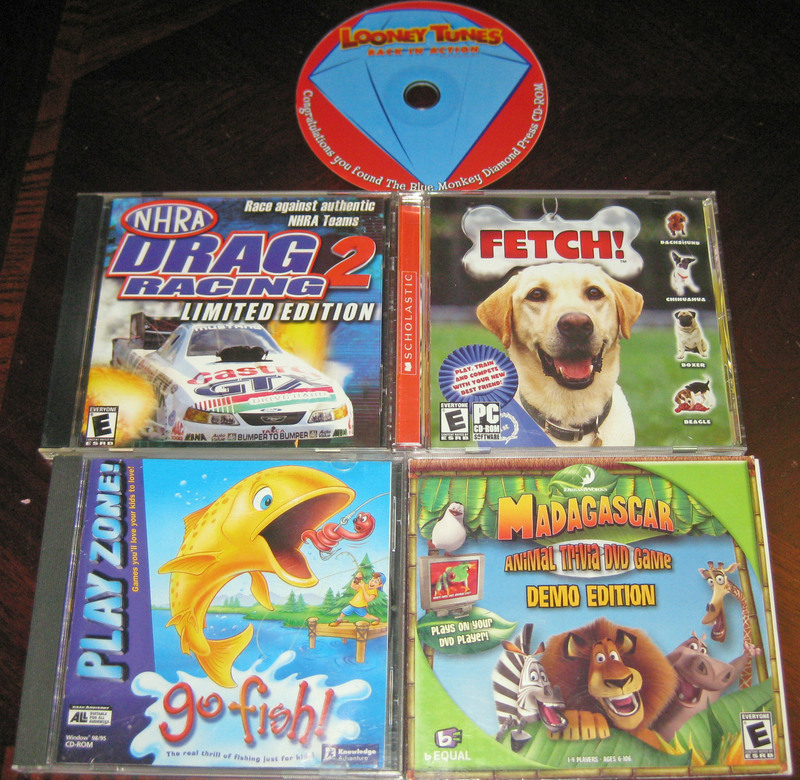 I have encountered this SelectSoft stuff before, in the form of dubious 100,000 Games and 333,000 Games packages. Lost & Found Volume 1, from Interactive Toys (1994): An ambitious title promising future volumes that I will need to watch out for. 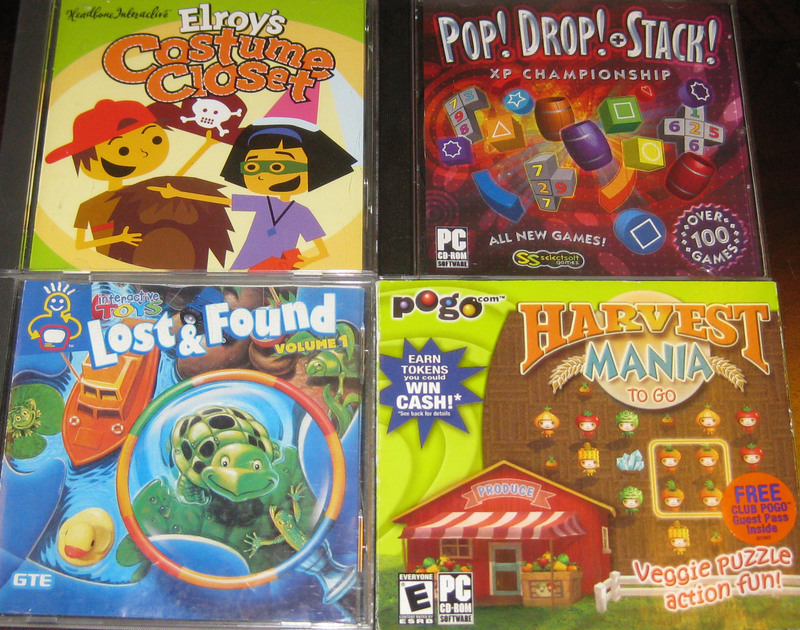 Harvest Mania To Go, from Pogo.com (2005): MobyGames has a record of this being a browser game from 2005. This copy also has a copyright date of 2005, so perhaps it was published concurrently. Seems to be a cross between color matching and Farmville. 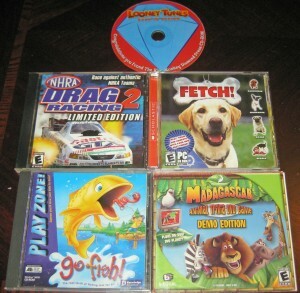 NHRA Drag Racing 2: Limited Edition (2000): The regular version is already in the database; the Limited Edition probably warrants a separate entry. Fetch! from Gamebryo, Virtual Playground, and ValuSoft (2006): You can pretend to care for a dog.